Loretta Lynn is a country music legend. There are no ifs, ands or buts about it. When she made her entrance onto the stage at Massey Hall, she was greeted by a standing ovation from an adoring audience. Earlier, Patsy Lynn, one of Loretta Lynn’s daughters, came onstage to thank the audience for coming to the show and announced that this year is Loretta’s 50th year of making music. After 50 amazing years of being a country music icon and staying relevant in the music business, a standing ovation before you’ve sung a note seems perfectly appropriate and deserved. 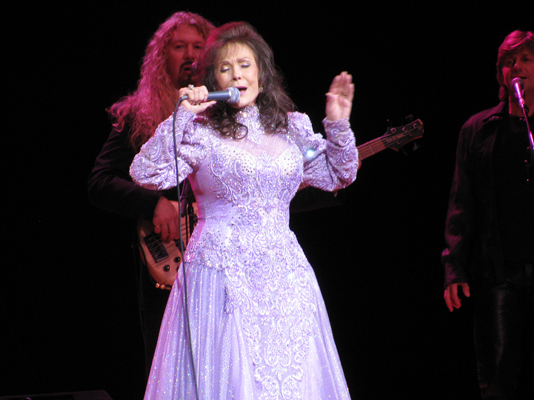 Wearing her signature traditional “old country” style gown, Loretta Lynn glittered and sparkled in floor-length lavender like Glinda the Good Witch from the Wizard of Oz. If Glinda was a country music icon! At 80 years old, Lynn’s voice sounds incredibly powerful and well seasoned – with her confidence as performer, she almost sounds better now than she did in the early stages of her career. In between songs, Lynn told humourous stories and traded barbs with members of her backing band. Upon mentioning that her foot hurt (she broke a toe recently), one band member suggested if she felt like dancing, that maybe she could just tap her good foot instead. Mock-grumbling, Lynn retorted that she should give him a “tap” on the head instead. Closing the show with “Coal Miner’s Daughter,” many audience members left their seats to gather at the stage. Before making her exit (with a visible slight limp), Loretta Lynn curtsied and blew kisses to another standing ovation. It was impossible not to feel awestruck – it’s not everyday you get to see a living legend perform.